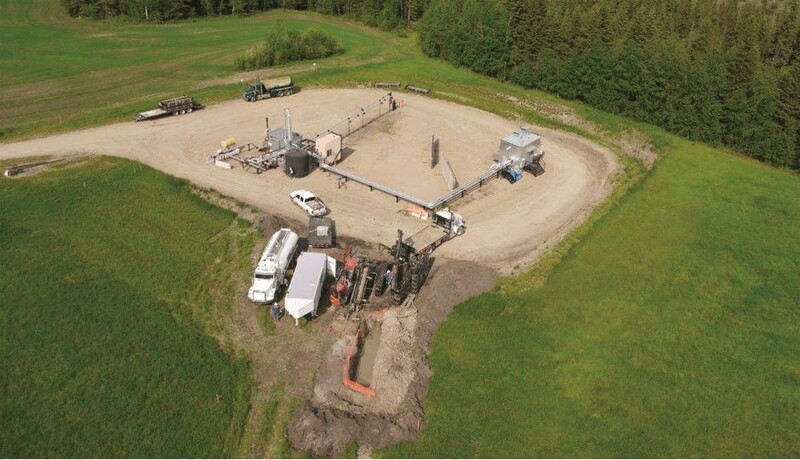 An aerial view of BPC Services Group’s Alberta trenchless pilot project with Devon Energy. The Western Canadian Sedimentary Basin (WCSB), a vast slab of sedimentary rock extending from the Rocky Mountains to the Canadian Shield, is not only prime territory for oil and gas exploration but for companies that install pipelines for the various operators pulling product from fields throughout the basin. Up until a few years ago, pipeline construction in the oil and gas sector has involved traditional open-cut construction methods, with its accompanying high ground disturbance, but that is starting to change, thanks to advances in horizontal directional drilling (HDD) technology and the wider acceptance of such technology throughout the industry. One company that has been able to capitalize on this change is BPC Services Group, which started offering trenchless pipeline construction in 2010 through a pilot project with Devon Energy, in Bonnyville, Alberta. BPC noticed that a lot of new construction was for short lines tying new wells into existing infrastructure, so the company saw an opportunity to reduce ground disturbance by using directional drilling instead of excavating trenches, Pipeline News North reported at the time. For Devon, BPC used trenchless technology to install a four-inch pipe over a distance of 865 metres through farmland and forested area. With trenchless, the new right-of-way eliminated the need for brushing and shortened the length of the line by about 100 metres. BPC’s Trenchless System, which employs horizontal directional drills and a survey tool that allows BPC to attain underground data without scoring the surface, can reduce the environmental footprint by about 95 percent of a conventional pipeline install. The company’s HDD equipment varies from 40,000- to 100,000-pound drill rigs, usually Ditch Witch and Vermeer brands. For the last couple of years, BPC has been laying sections of composite flex pipe for Beaumont Energy, which has been actively working the mature Viking play in southeastern Saskatchewan. The job involves laying 150 kilometres of trenchless pipeline, that will allow Beaumont to complete a waterflood system of enhanced oil recovery to extract product from the Kerrobert pool, which Beaumont acquired from Penn West Petroleum in 2012. Martin Campbell, BPC’s trenchless manager, said the circumstances surrounding the Beaumont project made it an ideal contract for BPC to take – considering the amount of infrastructure already in the ground from previous drilling activity and the private lands surrounding the pipeline route. “It's all arable farmland with lots of roads and lots of encumbrances everywhere, which makes conventional pipe open trenching difficult because you don’t go very far before you come up to something that you have to cross,” he said. Apart from being a less intrusive way of pipe laying, the method is also kinder to the environment because quite a bit less machinery is required, meaning lower greenhouse gas emissions. While the capital costs of trenchless construction are similar to a regular trench job, especially in a congested oilfield, Campbell said the method saves the operator money over the long term because there are virtually no maintenance costs. “HDD also eliminates the issue of going back to repair pipeline rightaways that can occur after a regular pipeline installation due to settling,” Campbell added. While trenchless is not without its challenges – one of the biggest is containing drilling mud that makes its way to surface, by not allowing the ground to fracture – the benefits appear to outweigh the drawbacks. Campbell indicated the company is keeping its five HDD rigs busy.